The Master System port of Sonic the Hedgehog scaled down the Genesis game and included the all-new Bridge, Jungle, and Sky Base (not to be confused with Sky Chase) Zones. Given the limitations, it wasn't too bad. The Game Gear version appears to have been a port of the Master System game, as it was not only released two months later, but also removes some unused sprites while adding others. The smaller screen also meant that things had to be scaled down, resulting in the Green Hill boss being laughably easy. The Master System version also holds the distinction of being the last game released for the console in North America. Green Hill Totem Pole Used in the Master System version, but not the Game Gear one. Green Hill Corner Tile An unused corner piece. Bridge Zone Tiles A spring in front of checkerboard, and a pole in front of some sky tiles. The bridges in this zone are never high enough to hit sky level. Jungle Zone Spring A spring not set on grass. Probably intended for Act 2. Labyrinth Pillars Some unused big and small pillar tiles! These were created specifically for the 8-bit versions, and they have no equivalent in the Genesis version. Sky Base Tiles A chain facing southeast, and an unused cannon facing northeast. Sky Base 3 Tiles Some unused slopes, and what appear to be laser turrets. The latter tiles are not in the Game Gear version. Sky Base 3 Slopes Just some unused slope tiles. Game Gear version only. Ground Segment Appears amongst the object tiles for Bridge Zone. It almost looks like the top is melted. Door? Appears amongst the object tiles for Labyrinth Zone. Perhaps it was intended to be a switch-operated door, like the ones in the Genesis version? Unused Newtron Found in Green Hill's tileset in the VRAM. These two animations are unused, while another animation is used only in Jungle Zone. Master System version only. Shield This may be a prototype shield animation. Game Gear version only. Unused Enemy Graphics for the enemy Batbrain appear among the Green Hill objects, and were probably meant to be used in the caves of Act 2. The Genesis version uses them in Marble Zone, not present in either 8-bit port. Game Gear version only. Ancient handled the 8-bit ports of Sonic 1 and were evidently going to credit themselves on the title screen with the text "©SEGA/Ancient 1991". In the end, though, only Sega received credit. An early version of the credits screen can be found in the Master System version at ROM offset 16AEE. The triangles in the background were replaced with yellow and blue stars in the final version. An unused rendition of Marble Zone is present in the Master System version's ROM at offset CD0A. This and the unused Batbrain graphics (present only in the Game Gear version) suggest that Marble Zone was intended to be included in the 8-bit ports of Sonic 1 but was cut due to time or space issues. This sound echoes twice. Unknown what it could have been used for. It could have been used for entering a Bonus Stage. A heavy bubbling sound. May have had a use in Marble Zone before it was scrapped? An alternative sound to the bumper sound? Sounds like an alarm. May have had a use in Scrap Brain/Sky Base? Developed by (C) 1991 Ancient - S Hayashi. A text string (with minor variations) used as filler in the ROM banks. Master System & Game Gear Version. This section is WIP: add more detail, elaboration, screenshots, etc. Extremely long and in-depth video. A white Sega splash screen with an animated Sonic and the trademark "Sega!" voice clip was added. This was done because the Game Gear doesn't have a logo screen incorporated into the BIOS, unlike the Master System. The smog clouds above Scrap Brain on the map screen were redrawn. The sprites for Sonic, invincibility, and shields are all redrawn to be smaller, to account for the reduced screen size. Warning signs were added near spike pits and cliffs in Green Hill in the Game Gear version. Various background elements are altered as well, such as the color of the mountains and the flower animations (which are closer to the 16-bit game). The Special Stages have different layouts in the Game Gear version, and a time limit of 2 minutes rather than 1. Due to the smaller screen, the Green Hill boss flies much lower and can be reached from the ground, making it a complete joke. On the other hand, the Bridge Zone boss is trickier, taking place on an actual bridge rather than an island. Fruit appears in the background of Jungle Zone. In the Master System version of Jungle Zone Act 2, the screen continuously locks as Sonic travels upwards through the stage, with the bottom of the screen acting as a bottomless pit. This little challenge would naturally have been completely unfair on the Game Gear, so it was removed. Jungle Zone's boss takes place in a steeper arena in the Game Gear version, making the bombs harder to avoid. 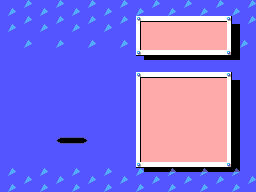 The first two acts of Labyrinth Zone have radically different layouts between versions. Most notably, the Chaos Emerald is much easier to get. In the Master System version, the Chaos Emerald is sitting in the middle of a spike pit; to get it, the player must collect an invincibility power-up a few screens below, run through a lengthy obstacle course to get to the spike pit, jump in, grab the emerald, and jump out before the invincibility wears off. In the Game Gear version, it's just... sitting there, out in the open, very near the end signpost. The final boss no longer enters a second phase, and attacks with three floor-mounted flamethrowers rather than a moving electric wall. The homing device was also moved from above Robotnik to the middle of the ceiling. The credits text has been updated to reflect the hardware. This page was last modified on 24 November 2018, at 17:42.